Warriors have today launched their brand new Home, Away and Third Shirts ahead of the 2018/19 season. 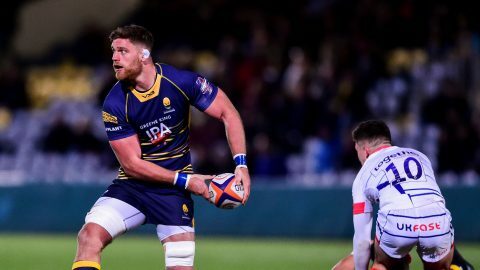 Supporters enjoyed a bumper day of action at Sixways on Thursday afternoon as the Kit Launch coincided with a Sixways Store relaunch and an Open Training Session. The three shirts, along with the training and leisurewear, were designed by Warriors’ Official Kit Partner VX3 in collaboration with players Ryan Mills and Luke Baldwin, ensuring that everything created was made specifically with the Warriors spirit. The Home Shirt reflects Warriors’ traditional colours of Blue and Gold with a modern twist. The time-honoured blue dominates the shirt, with golden bars running across the front and back, as well as under the arms and around the neck. 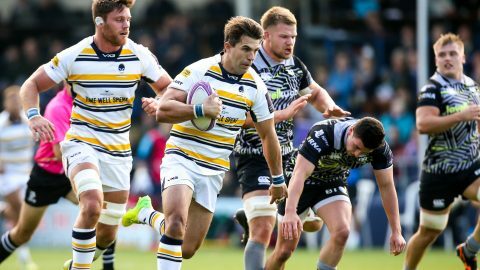 The striking Away Shirt is like no other in the Gallagher Premiership, both in colour and design. Contrasting blue and cyan stripes run across the front of the shirt and the Warriors logo has been cleverly sublimated into the design. The Third Shirt sees a traditional rugby union design, which is predominantly white, with the Warriors Blue and Gold running through. 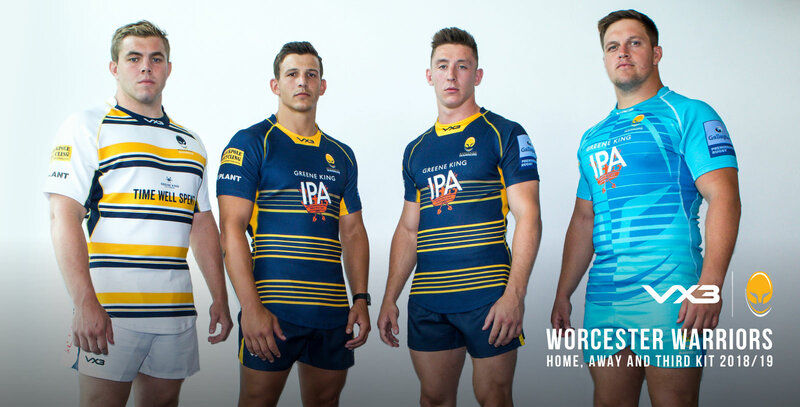 All three shirts are now available to buy at the Sixways Store powered by Lovell Rugby, as is Warriors’ new training and leisurewear. The Sixways Store is open on Thursday until 6.30pm and will then be open from Mondays to Fridays from 9am to 5pm. You can also shop online by clicking here. Don’t forget, the best way to watch every Warriors match in 2018/19 is with a Season Ticket. Season Tickets start from just £250 for Adults and £50 for Under 12s and are available by clicking here, calling 01905 459309 or visiting the Ticket Office.